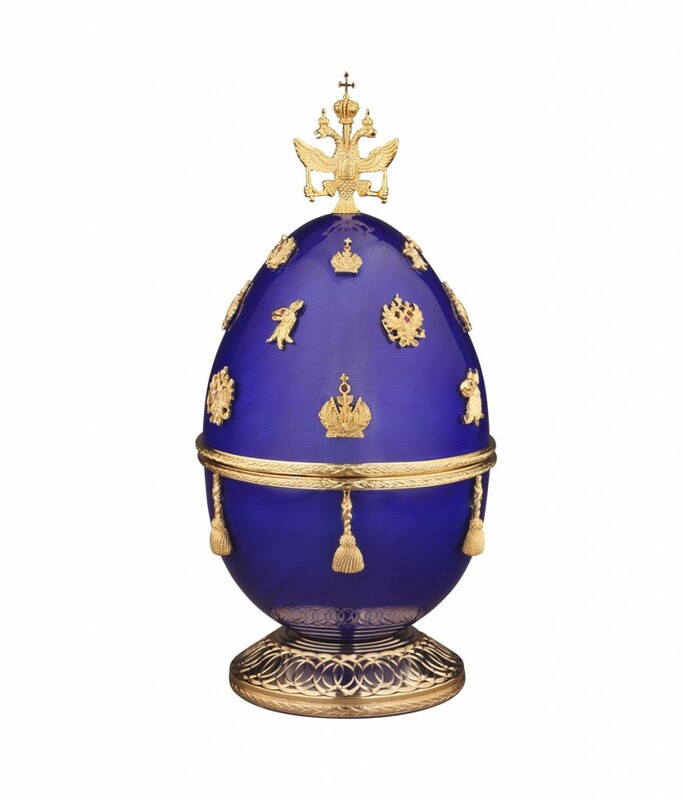 In 1913 Tsar Nicholas II presented his wife, the Empress Alexandra Fedorovna, the Romanov Tercentenary Egg designed and made by Carl Fabergé. This Easter gift was presented on 14th April 1913. 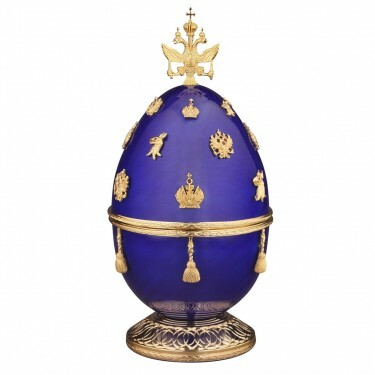 For 2013 Theo Fabergé, grandson of Carl Fabergé, has designed the Romanov Quadricentenary Egg which will be presented to the City of St Petersburg. The theme of the Egg is the quadricentenary of the House of Romanov, which had been founded by Mikhail Fedorovich Romanov in 1613. 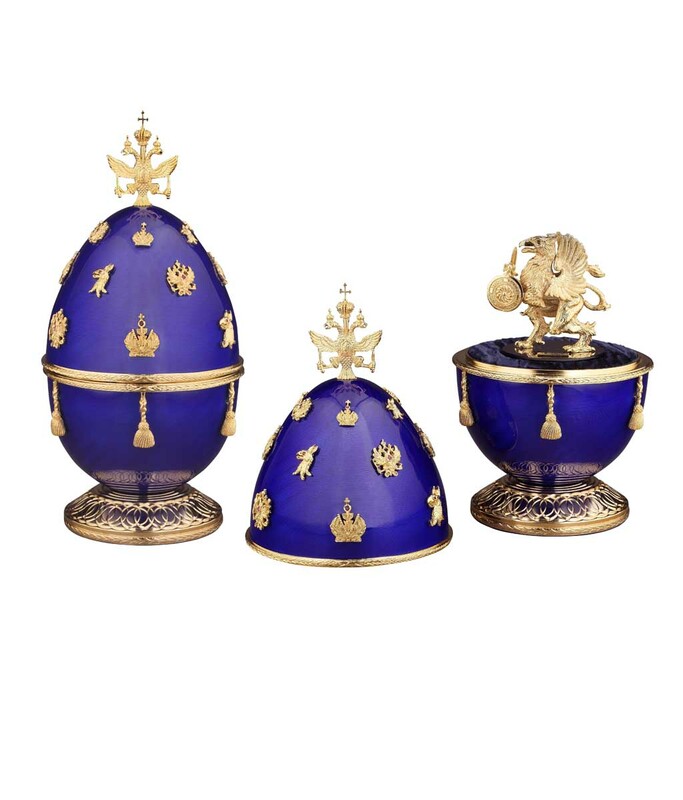 This Egg with 18 miniature decorations, celebrating the 18 Romanov Tsars, is created in solid sterling silver with sapphire blue royal guilloché enamel and hard gold plated with 24 carat gold. The finial of the Egg is the double-headed Romanov eagle, but in fact a triple-headed eagle, so that from which ever angled viewed the double-headed eagle is visible. The base, ornamentally turned on Theo Fabergé’s Holtzapfel lathe from 1860, again celebrates the 18 Romanov Tsars with 18 deep cuts and covered with pure 24 carat gold. The surprise within, the Romanov Griffen in sterling silver and 24 carat gold. 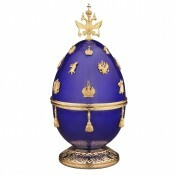 The Griffen with sapphire eyes can be removed and displayed outside of the Egg. 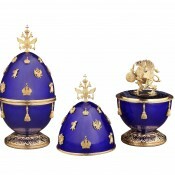 Materials: Sterling silver with 24 carat gold, diamonds, rubies, sapphire blue guilloché enamel and blue crushed velvet.